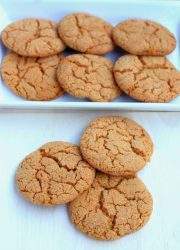 Old fashioned Ginger Cookies, are the perfect cookies to bake to go around the neighborhood during the holiday season. The spices in the cookies fill the whole house with a wonderful aroma. Preheat the oven to 325 F and grease 3 baking sheets. Sift the flour, baking soda and spices into a small bowl and set aside. Place the butter and two-thirds of the sugar in the bowl of the mixer and cream together until light and fluffy. Lightly beat in the egg and stir it in. Stir in the treacle and the lemon juice. Now add the flour mixture and mix in thoroughly to make soft dough. Shape the dough into 2 cm balls. Roll these balls in the remaining sugar to coat and place them on the prepared baking sheets, spaced around 2 inches apart to allow the dough to spread. Bake for about 12 minutes, or until the cookies are just firm to touch. With a spatula transfer the cookies to a wire rack and cool completely. Always use fresh spices when making any cookies. Spices left in the spice rack for over a period of time lose their flavor and aroma. These cookies need to be baked in batches. It is best not to put more than 2 trays in the oven at a time. Storing-The cookies store well at room temperature in an airtight container for a week.